Motorola introduced the Droid Pro, an Android smartphone aimed at the BlackBerry market, along with several other Android handsets, at a Tuesday evening event in San Francisco. With the Droid Pro, which is due to come out on Verizon Wireless next month, Motorola built in features designed to appeal to enterprise IT departments. Business users are open to giving up their BlackBerry devices if there is an alternative that meets their requirements, said Sanjay Jha, CEO of Motorola Mobility, as he introduced the phone. Motorola’s event took place as this week’s CTIA Enterprise & Applications event got under way in San Francisco. 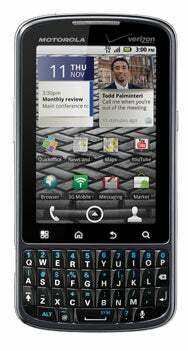 The Droid Pro features a built-in QWERTY keypad and a 3.1-inch touchscreen as well as a 5-megapixel camera. It allows users to both read and edit Microsoft Office documents. If the device is lost or stolen, an administrator can remotely wipe the data from both the phone and the removable MicroSD card in the phone. In the first quarter, Motorola will add the ability to encrypt all the data on the phone and the MicroSD card. In addition, administrators can mandate complex passwords and require regular password changes. The phone is also designed for business travel, with radios for both CDMA (Code-Division Multiple Access) and GSM (Global System for Mobile Communications) networks, including their 3G variants. It runs the Android 2.2 operating system, also known as Froyo. The Droid Pro may not quite displace BlackBerrys in large enterprises, but it is a step in the right direction, especially with its security features, said analyst Avi Greengart of Current Analysis, who attended the event. One missing piece it should have is the ability to track changes in Office documents, he said. Motorola featured several other Android handsets designed for consumers at the event. The company did well to get into Android early when it launched both the original Droid and the Cliq approximately a year ago, Greengart said, but the company now faces stiffer competition. Introducing a wide range of devices based on the hot mobile platform is a good strategy for the company, he said. “Motorola is bringing Android-based smartphones to all consumers,” Jha said. Jha hailed tiered data plans as one factor that will help to drive consumers’ rapid embrace of smartphones. These plans, like ones introduced earlier this year by AT&T with the Apple iPad tablet, provide a range of plan prices with limited amounts of data allowed per month. These keep average consumers from having to shoulder the cost of the most active subscribers’ heavy data use, making the cost of a data plan more palatable, he said. “That will drive the democratization of wireless broadband access,” Jha said. Critics have said tiered plans could inhibit subscribers’ mobile Internet use and the development of new mobile applications. As Android smartphones proliferate, they are falling in price and coming within reach of more consumers. On Tuesday, prepaid U.S. carrier Cricket announced the Ascend, a handset from Huawei Technologies that will go on sale this month for $149 without a contract. Motorola unveiled low-end Android phones at its own event, though as with the other introductions on Tuesday, the company left it to carriers to announce pricing. The Citrus, coming to Verizon later this year, is a small touchscreen phone designed for students and other first-time smartphone users. In a nod to ecological concerns, Motorola used post-consumer recycled plastic for 25 percent of the plastic in the device. The Spice, also designed for new smartphone users, features a slide-out QWERTY keypad for fast, frequent texting. It also includes an exclusive application called Flashback that compiles a “digital diary” of all phone calls, text messages and photos from a given day. The Spice will ship soon, first in Latin America, Motorola said. Three other Android phones unveiled at the event were announced earlier in the day by AT&T, to ship in time for the holiday season: The Flipout, a small, square handset that swivels open to reveal a keypad; the Flipside, a more conventional small slider phone with a larger keypad; and the Bravo. Motorola also showcased the Defy, announced last month, which is water-resistant and also resists dust, scratches, salt, and shocks from being dropped. It is coming to T-Mobile USA for the holidays, Motorola said.